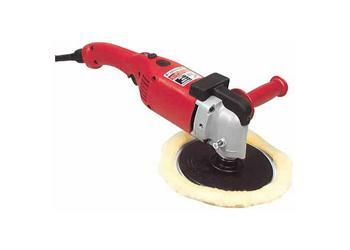 Exclusive Milwaukee electronics provides speed control in this powerful 11 amp polisher. A spindle lock provides convenient accessory changes. Self-stopping long life brush system minimizes down time. Milwaukee's exclusive QUIK-LOK® cord provides instant field replacement for damaged cords. This polisher, when used with the foam pad accessories, is ideal for the clear coat finishes of today's cars. The combination is designed specifically to run cooler and reduce swirl marks. Pad Size 7 in./9 in.